Gopadevi tells Vyomesh that she will make sure that he will look more beautiful than Radha during his wedding. Radha angrily leaves. Gopadevi/Krishna thinks Radha has entered last phase of anger relief. Nand gets bullock cart ready to go to Yashoda’s parents’ house to meet Krishna and Balram and asks Radha to get on it. Yashoda thinks she has to stop him and says there is a enmity going on between Barsana and Vrindavan, so he should stay here to protect our people. Nand says she is right and calls Rohini to accompany her. Yashoda says someone should be there to serve him, so she will go alone. Nand agrees and asks drive to drive cart. Yashoda thinks she is going to Barsana to meet Krishna. 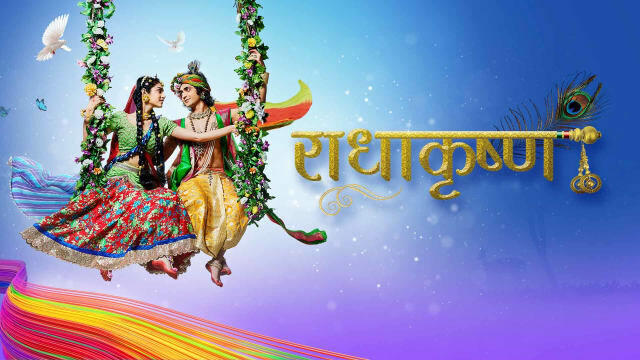 Radha thinks Kanha loves her so much that he is not opposing her wedding or he is confident that she will not marry someone else. Yashoda reaches Barsana border and sees guards standing. Ayan calls guards aside and asks them to watch out for any suspicious person trying to enter from Vrindavan’s side. Yashoda silently crosses border and walks in. Ayan sees her and follows her. She mingles among ladies. Ayan asks red veil lady to stop. A lady stops and asks Ayan what happened. Ayan apologizes her and thinks where did lady go. Radha’s haldi ceremony starts. Kirtida asks Gopadevi to apply haldi to Radha. Gopadevi walks to Radha. Radha asks how can let her marry someone else. Krishna says his love for her is making her agree to all her terms. He wants her to sacrifice her anger and realize true love. She asks to apply haldi then. He says he will not, else will have to marry her. He walks away from there. Gopadevi sees Yashoda and walks behind her. Ayan also sees her as same red veil lady and tries to follow her, but Gopadevi with other girls stops him and asks what is brave Ayan doing here in women area. He says he has some important work. She laughs that every male says same and pushes him away. Ayan goes to Vyomesh and says he need his help to find out a suspicious intruder woman entering Barsana. Vyomesh says his black magic can find out anyone and creates a bird via black magic. Ladies give bathe to Radha after haldi ceremony. Radha reminisces Krishna telling that what he does is love and she does is infatuation, Radha fighting with him and breaking his shaligram and bansuri, etc. She cries and realizes that Krishna was telling right. Krishna gives moral gyaan that fire is important in life, it provides light to us, but if erupts high, it will burn everything; so if they mix water in it, they can control it; similarly if they can control anger, they can achieve peace in life. Precap: Radha refixes Krishna’s shaligram and bansuri/flute and plays it. Krishna walks to her. Radha requests to marry her.